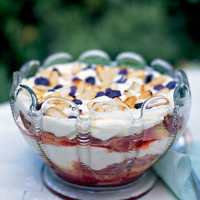 Since this trifle is made with a syllabub, it has to be served soon after it is assembled (no more than an hour later), otherwise the muscat wine in the cream starts to seep out. But if all the elements are ready, it shouldn’t be demanding. Preheat the oven to 180°C/gas 4. Beat the eggs with the caster sugar until very pale and tripled in volume. Add 1 tbsp lukewarm water. Using a large metal spoon, fold in the flour with a pinch of salt, being careful not to knock the air out of the eggs. Pour into a 22cm greased and base-lined round cake tin. Bake for about 30 minutes until it is coming away from the sides of the tin; it will be very thin. Leave to cool then cut into fingers. To make the gooseberry purée, heat the sugar in 250ml water, until it has dissolved. Add the gooseberries and simmer for about 8–10 minutes or until tender. Drain, retaining the cooking liquid. Mash the gooseberries, then leave them to cool. Taste and add more sugar if you like (remember that the cream and sponge are both sweet). Boil the poaching liquid until syrupy, then add the muscat. Leave to cool. Beat the Mascarpone and crème fraîche together with the sugar, gradually adding the lemon juice and muscat. Put a layer of sponge fingers in the bottom of a serving bowl. Soak the sponge with the poaching liquid, cover with a layer of gooseberries, then a layer of cream. Repeat (you’ll probably only manage two layers of each) and finish with a layer of cream. Decorate with toasted almond flakes and crystallised violets. More of the muscat used in the recipe will up the levels of perfume deliciously, and cope with the sweetness of trifle, too.